At MonkeyMedia Software’s Catering Institute we are ALWAYS looking for ways to help our restaurant community grow catering sales. Truth is, I am so lucky as CEO of MonkeyMedia Software mostly because I get to collaborate with the most talented and generous people in our industry! So, you can imagine how proud I am to announce our special guest for our upcoming webinar! Our “Catering Makes Sense” Webinar Series has been growing and growing! Hundreds of people attend our webinars each and every time. Well, coming on February 6th, 2013, we have a wonderful social media opportunity! Please join us! Hear Dan Kim speak about a social media strategy to grow catering sales! REGISTER HERE TODAY…..But hurry! There are only 75 seats left! I have always maintained that the all aspects of our restaurant operations will “collide” with the catering and off premise sales channels as the market changes and grows. That’s a good thing! I am firmly believe in using Social Media as a tool to grow sales, as I have in my own business. The content that I create continues to provide a creative outlet which is so important for my own personal development process. Now that I have been using my own social media strategy and the dividends have paid off, not only do I understand the tools better, but I am certain of the Return on Investment. Social Media is an important strategy for any brand. And so, just like every other sales channel, Social Media can drive catering customers to your brand in ways that as a community, we have not even begun to explore yet. It is with great pride, that I get to send this invitation today for you to register your teams for our upcoming Webinar on February, 6, 2013 at 3PM EST. 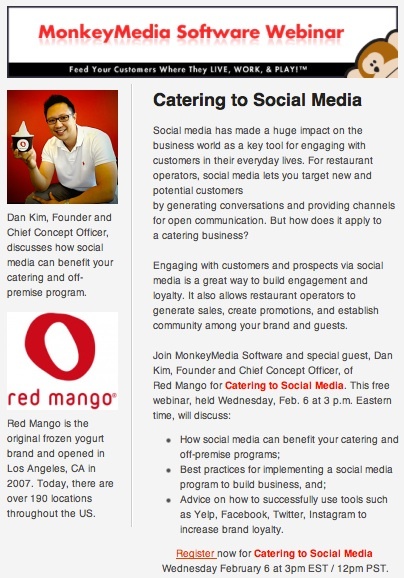 “Catering to Social Media” with Special Guest, Dan Kim, Founder at Red Mango Yogurt. Check out Dan’s Twitter page @dankimredmango or @monkeymedia for more……. Social Media Traffic is very important to a Catering, especially for local Providers. Thank you for taking time to comment Michelle…..